John Greenough, senior research analyst at Business Insider (BI) Intelligence, estimated that a quarter billion internet of things (IoT) devices were used by manufacturers worldwide in 2015, and that number is expected to reach one billion by 2020. 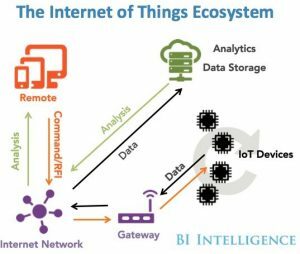 The IoT is surely the next technological revolution in the technology sector, and adoption is well on its way. 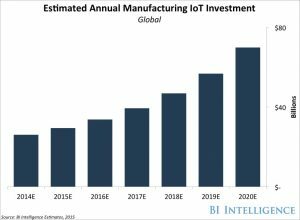 In addition, global manufacturers are expected to invest $70 billion on IoT solutions in 2020, up from $29 billion in 2015 (Figure 1). 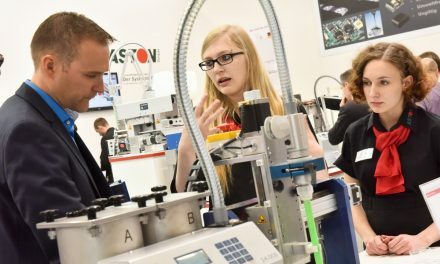 While spending on IoT initiatives is increasing, manufacturing has seen the highest return on investment from IoT solutions compared with other industries—an average 28.5% increase in revenues between 2013 and 2014, according to a TATA Consultancy Survey (Internet of Things: The Complete Reimaginative Force, TCS Global Trend Study, July 2015). Fig. 1: A BI Intelligence study predicts manufacturers will invest $70 billion on IoT solutions in 2020. Manufacturers are currently using IoT solutions to track assets in their factories, consolidate their control rooms, and increase their analytics functionality through predictive maintenance. Many IoT solutions are still basic today, but industry analysts predict that manufacturers will be implementing complex technologies in the future, such as autonomous robots and augmented-reality tools. As IoT technology plays a greater role in the manufacturing world, factory managers will be able to take their efficiency and waste-reduction efforts to the next phase using business intelligence. Advanced intelligence will help electronics manufacturers cope with the sheer number and complexity of production activities that affect their yields and reliability, providing a granular approach to diagnosing and correcting process flaws. Operations managers can use a business intelligence tool to take a deep dive into historical process data, identify patterns and relationships among discrete process steps and inputs, and then optimize the factors that prove to have the greatest effect on yield (Figure 2). Fig. 2: BI Intelligence view of the manufacturing IoT ecosystem providing operators with access to data, analytics, and IoT device connectivity to manage and improve yield and productivity. With IoT applications constantly gathering huge amounts of real-time, shop-floor data, what is needed now are solutions that can aggregate these isolated data sets and analyze them intelligently to reveal important insights. Business intelligence has to be the next step to leverage the vast amounts of data gathered by IoT initiatives, enabling better decision-making and ultimately reducing cost and waste throughout manufacturing as the industry moves into a more digital future. The electronics manufacturing industry has been investing in automation and shop-floor control systems, but let us now focus on the effects of IoT and printed circuit board (PCB) manufacturing. Today, the introduction of IoT technology and machine-to-machine communication enables collecting large amounts of data to see what’s happening on the shop floor in real time (Figure 3). But what is to be done with all that data? How will operators, managers, and executives be protected from drowning under this deluge of information? For manufacturers seeking to adopt an IoT methodology, business intelligence is needed to analyze IoT data in a useful way—smart software that can automatically translate all of this data into meaningful and actionable reports, and one that is easily configurable. Manufacturing no longer can get by with just analytics software. On the shop floor, business intelligence software must process information from individual machines, including the entire factory, to provide true insight on what’s happening with all manufacturing processes in real time. Such software has to answer three questions: (1) what happened?, (2) why it happened?, and (3) what happens next?. As the investment and revenue from IoT initiatives increase, manufacturers cannot afford to wait for an intelligent solution to manage all of this incoming data and put it to good use. Fig. 3: Business intelligence software must process information from individual machines and the entire factory for true insight on what’s happening with all manufacturing processes in real time. Traditionally, manufacturers have focused their attention on reducing waste in their production processes and improving product quality and yield. However, electronic products have changed drastically even just in the past ten years. Manufacturers have had to adapt to a new market reality to stay profitable and competitive at the same time. 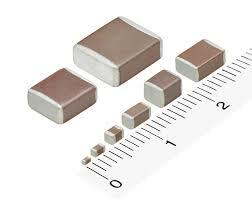 These changing market demands have caused the electronics manufacturing industry to switch from high-volume, low-mix manufacturing to low- or medium-volume, high-mix products. Whereas high-volume, low-mix lines can be expected to make several products within minutes, a low-volume, high-mix line will make the same quantity of products over an entire day. This variation in products, along with the fixed costs of production, surface mount technology (SMT) machine investment, direct and indirect labor costs, etc., in the high-mix situation are more than 250 times higher than for high volume. Manufacturers have to find a way to minimize this greater cost while achieving comparable levels of productivity. Increasing requirements for product quality and reliability also contribute to the growing need for meaningful business intelligence in electronics manufacturing. Greater demands and expectations from industries such as aerospace, automotive, communications, and medical put pressure on manufacturers to ensure that their customers and factory operations are working properly and optimally. Analyzing data simply is not enough. Company managers need to use the data to create knowledge that will positively affect manufacturing for their customers. Intelligence in Electronics Manufacturing – What Does It Look Like? As IoT technology plays a greater role in the manufacturing world, factory managers will be able to take their efficiency and waste-reduction efforts to the next phase using business intelligence. Advanced intelligence will help electronics manufacturers cope with the sheer number and complexity of production activities that affect their yields and reliability, providing a granular approach to diagnosing and correcting process flaws. Operations managers can use a business intelligence tool to take a deep dive into historical process data, identify patterns and relationships among discrete process steps and inputs, and then optimize the factors that deliver the greatest effect on yield. 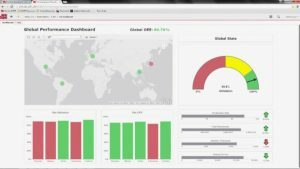 An ideal business intelligence solution should provide dashboards that can be easily configured to address specific requirements and deliver real-time performance indicators (Figure 4). 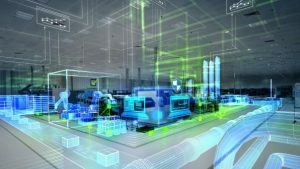 Data needs to be presented in an informative, intuitive way that provides both high-level information on what is happening on the shop floor, and lower level information about each stage of the manufacturing process. Such a solution must provide the capability for easy drill-down analysis, and include self-creating capabilities to automate further insight and higher granularity of the analysis, eventually leading operators to detect the root cause for problems on the shop floor. Intelligence reports need to be automatically generated and distributed appropriately, which would reduce the response time to critical issues while removing the tedious task of compiling daily, weekly, and/or monthly reports. Targeting meaningful reports to specified recipients improves communications and teamwork, while improving transparency. Fig. 4: An ideal business intelligence solution provides a dashboard with real-time performance indicators, such as visibility into manufacturing equipment, processes, products and supply chain performance. Shown here is the Valor IoT Manufacturing Analytics product. Zac Elliott is a Technical Marketing Engineer with the Valor Division of Mentor, A Siemens Business. Working directly with electronic manufacturing service providers in the medical, aerospace, automotive, and public-safety markets, Zac ensures that key requirement for the Smart Factory are fulfilled using software and automation. Before joining Mentor, he was responsible for developing and implementing solutions for a global contract electronics manufacturer, providing an in-depth understanding of the market pressures driving Industry 4.0. 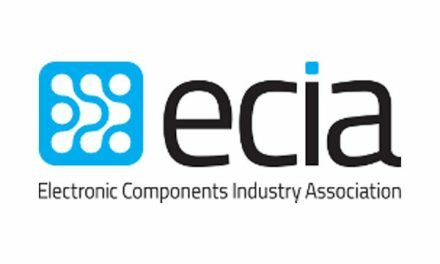 Recently, Zac has served as a member of the IPC task group working on an industry standard for traceability of critical electronic components.